Discounted admission and ride tickets for the 2017 Florida State Fair now are available at all area Walgreens through February 8, as well as online at FloridaStateFair.com. Individuals and families can save up to 30 percent off the price at the gate by buying in advance. The 113th Florida State Fair is scheduled for February 9 through 20 at the Florida State Fairgrounds, located at I-4 and US Hwy 301 in Tampa. This year’s theme, “Picture Yourself at the Fair,” emphasizes all of the unforgettable moments waiting to be captured – all at an excellent price and always with free parking. Adults can save up to $4 by purchasing advance admission tickets for $9, while tickets for seniors and kids are $2 off the regular prices of $9 and $7 respectively. Weekday armbands good for all-you-can ride on either February 9, 13, 14, 15 or 16 are $20, while ride armbands good for any one day of the Fair (including weekends and holidays) are $30 –a savings of $5 on both. For less than the price of a movie ticket, the 2017 Florida State Fair offers some of the best family entertainment in the country, including the only travelling sea lion act in the country; a museum quality, interactive exhibit that explores the influence of candy on pop culture; a spectacular Big Top Circus; an opportunity to see the majestic Budweiser Clydesdales up close; the wild and wacky antics of the Sunshine State Lawnmower Races; the chance to feed a giraffe and see more than 5,000 other animals – and so much more. As the first State Fair in the U.S., the Florida State Fair also gives Fair goers an opportunity to be the first to experience some of the newest thrill rides and outrageous Fair food. Discounted admission and armband tickets are available at www.FloridaStateFair.com. Tickets also can be purchased at Florida Walgreens locations through February 8. Tickets for the Country Gold concerts held February 14 and 15 can only be purchased through the Florida State Fair Authority. Shows will be at 2 p.m. The concert on Valentine’s Day features Leroy Van Dyke, Barbara Fairchild, David Frizzell and Johnny Lee, while the February 15 show stars Leroy Van Dyke, Steve and Rudy Gatlin, Bobby Bare and Marty Haggard. For more information about the Florida State Fair, including announcements regarding entertainment and promotions, go to www.FloridaStateFair.com or follow the Fair on Facebook and Twitter. The mission of the Florida State Fair Authority and its Board of Directors is to create positive entertainment experiences through: the annual Florida State Fair; a variety of year-round events; quality competitive programs; a commitment to agriculture, education and community service, and a focus on new opportunities. The Florida State Fair Authority does not receive state, county or city tax dollars. 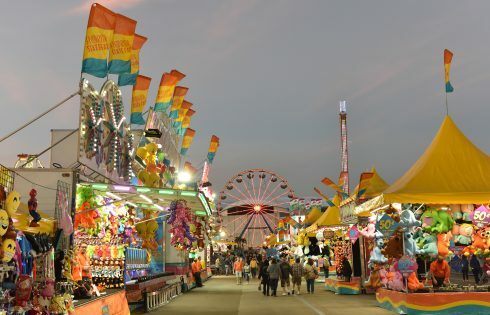 Operations are funded by revenue generated by the annual Florida State Fair and the rental of Fairgrounds facilities to outside entities throughout the year. For more information about the Florida State Fair Authority, go to www.floridastatefair.com.